Many small businesses owners are misinformed about franking machines and tend to think that franked mail is not the cost-effective solution for a business as small as theirs. This is simply a misconception. there a plenty of low volume franking machines to choose from so your business can also benefit from lower postage costs. Franking solutions covers diverse types of businesses with regards to the amount of mail they send. From the low volume franking machine to high volume, there is something for every company. Since small companies are more likely to send less mail per day, a low volume franking machine is just what they need. But they could upgrade to mid-volume or high volume as and when necessary. Royal Mail does not supply these machines themselves but they have approved a number of suppliers from whom you can be able to either rent or buy a franking machine. A ratified supplier has the obligation to evaluate your postage needs and advise your company on the system that will best suit you. Depending on the franking machine volume, and whether you choose to buy or rent, the costs will vary. Also you may be required to pay the service and maintenance fees of the machine as well as purchase your own labels and ink. Normally, you can rent a low volume franking machine for as low as £15 per month. However, it is best to shop around for the best quotes although the prices could be fairly fixed across the board. Different companies have diverse offers; some include starter kits of labels and ink. For first time users, a representative from any of the approved companies you choose should be able to orient you on how to get started with the machine. A franking machine typically saves you up to 34% of postage costs. On every first class letter, you save 10p and 18p on each second class letter you post. You could save up to 28p on a 2kg parcel and 13p on a large letter. Over time, the savings accumulate and you may even recover the cost of buying the machine. 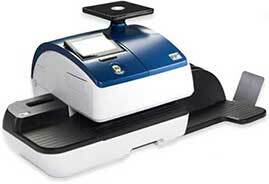 There is a number of low volume franking machines available for small companies to rent or buy. Comparing their costs over benefits, you should be able to get the most suitable machine for your business. Some of the common low volume machines are as discussed below. At the simple touch of a button this Pitney Bowes machine lets you calculate and weigh postage with the help of an in- built scale. The postage is precise and the machine even lets you print promotional messages on the envelopes. This low volume franking machine could be a valuable asset to small companies. 1) The DM60 is fitted with an essential 2.5kg weighing platform, which besides assuring that every package and or letter carries the right postage value, also frees up your desk space. 2) In less than a minute, this franking machine saves you the unnecessary time consuming trips to go buy stamps since you can now order your postage over the phone. 3) You can now say goodbye to under or over stamping as the DM60 ensures precise postage each time you send mail. 4) This machine helps to put your company name as well as logo on each letter you post thus promoting your company. 5) DM60 presents you with standard mail packages, letters, and recorded as well as special deliveries. 6) The DM60 is connected to a protected server through the Internet allowing software updating services, postal tariff alterations, as well fast and smooth downloading of advertisement slogans. Offering a compact package with sophisticated features including an integral 2kg scale, superior quality digital printing, up to 10 custom slogans and a pin protected access, the Neopost IS-240 is the perfect franking machine for upcoming businesses. This machine offers a more convenient, cheaper and efficient option to stamps. This machine costs about £995, but the price differs from one dealer to another so it is good to compare the prices before purchasing. 1) Neopost IS-280c offers a cost effective solution with its precisely calculated postage that helps avoid over or under stamping as well keeping your mailing list updated via a printed external address. 2) The machine increases your productivity thanks to its 2kg assimilated scale as well as its postage rate wizard which makes it simpler to calculate the correct postage. 3) Process management: the Neopost IS-280c helps track, control, and monitor your postal outflow and keep your business running with on-line ordering as well as low-ink alerts via email. 4) Effective communication: this franking machine helps you convey a more professional image of your company. The ink- jet technology allows for clearer imprints. Also, through printing your logos or slogans and marketing messages on the envelopes, you are able to promote your business more effectively. Are you a small business, organisation or home office ready to move out from the bungling hand- applied stamping to a more automised posting? Then the PostBase Qi3 from FP is exactly what you are looking for. You can now say goodbye to the hustle of time- wasting trips in search of stamps. With the PostBase Qi3 machine, you can now automatically print the right postage on your packages and letters thanks to its integrated scale. 1) This franking machine allows you to process your mail swiftly with up to 30 letters every minute. 2) The machine’s compact size will comfortably fit into your existing space hence convenient on space. 3) It offers swift and accurate postage thanks to its superior integrated scale. 4) This machine also allows you to add customised messages on your postage prints. Also, its integrated advertising allows you to place the company’s image on your mail as well as the company logo, all with the touch of a single button. With the above information in mind, the decision as to which machine best caters for your company needs is up to you. Getting the best quotes could be tricky, but not with BusinessQuotes.co.uk. At BusinessQuotes.co.uk, we make it our business to ensure that all our clients get the best deals there is. Get the best deals from top-rated sellers by simply asking for a quote using the link below.